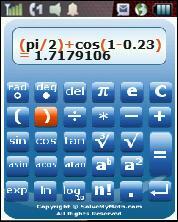 A new Scientific Calculator by SolveMyMath. Handles Trigonometric, Exponential and Logarithmic functions, roots, powers and factorials and supports using brackets to override operator preferences. Call = select, OK; * key = equals; # = decimal point and clears results. To go back to the menu, highlight the return key and press Call. Left and right arrows move through help screens, keep pressing either to exit help. Click the DOWNLOAD (jad) link above. If that doesn’t work click Help in the top menu for some tips.